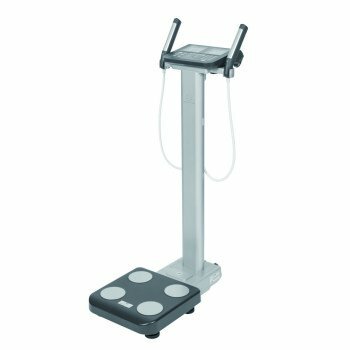 Tanita is the world leader in body mass weighing and measuring equipment. The device uses the BIA method otherwise known as bioelectrical impedance analysis method. BIA is a simple, quick, and non-invasive means of measuring body composition, making it particularly useful for to measure the composition of the body. The Tanita Body Diagnostic calculate “body fat ratio,” “body fat mass,” “fat free mass,” “estimated muscle mass,” and “Base Metabolic Rate” using data derived by the Dual Energy X-ray Absorptiometry (DXA) method using BIA. Through the use of 8 electrodes, the Tanita Body Diagnostic makes it possible to show separate body composition mass for the right arm, the left arm, the trunk, the right leg and the left leg.